Take a look at your schedule and seriously evaluate it. * When do your days begin? * When do your days end? * What times/activities are the same almost every day? * What classes/outings appear regularly on the calendar? What do you want to achieve with your children? What are your motives? What’s your parenting vision? * What activities would you like to do throughout the day and week? Consider all aspects of your child’s being. Consider what they will need socially, physically, intellectually, creatively, emotionally, and spiritually (S.P.I.C.E.S.). * Record all of your ideas and inspiration. Take a piece of paper and jot down all the things you would like to do with your children. * There are natural things that occur every day… for instance, we read the Bible every night before bed. * Consider alternating quiet activities with more active activities. * Make sure to take into account the times for meals and snacks. * Consider having something quiet/focused for your kids to do while prepping snacks and meals (colouring, reading, or an activity tray is ideal for those times). I find that when I’m in a “rut” I need to write things down to keep me accountable. After having a few weeks of success I might be more spontaneous. However, even when planning in this kind of detail, I refer to it as a rough guide (not as a set “to do” list). The one thing parenting continually teaches me is that I must be flexible. If putting your activity ideas into a schedule or calendar isn’t your thing, then maybe you’ll like this idea. I have my core activity ideas on index cards. They’re laminated and on binder rings. I have a set for physical activities, a set for creative activities, and a set for intellectual activities. If I get stumped for ideas, I’ll look through the cards with my kids and select an activity to do. Are you still in need of some ideas? I put together a list of 54 kid’s activities on a FREE downloadable resource that I made especially for you! Simply click the download button for your copy! 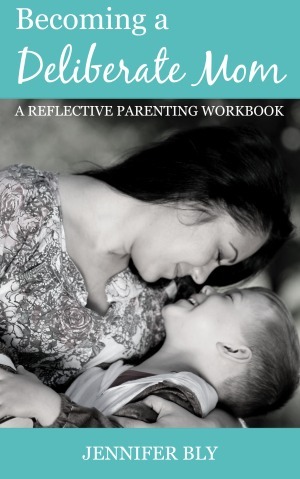 Intentional planning for our children can be tough. Do you need some quick ideas to implement with your children? Or maybe you need some inspiration? Here is a list of 54 easy-to-implement activity ideas for kids. Please note, I’m a former early childhood professional and many of my ideas are gleaned from my experience and training. However, I need to emphasize, I’m by no means an expert on play. 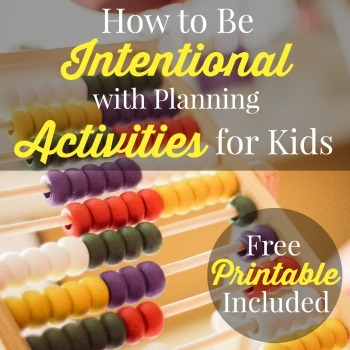 I struggle with spending intentional play time with my children and so I share these ideas not just for your benefit but for my benefit as well. 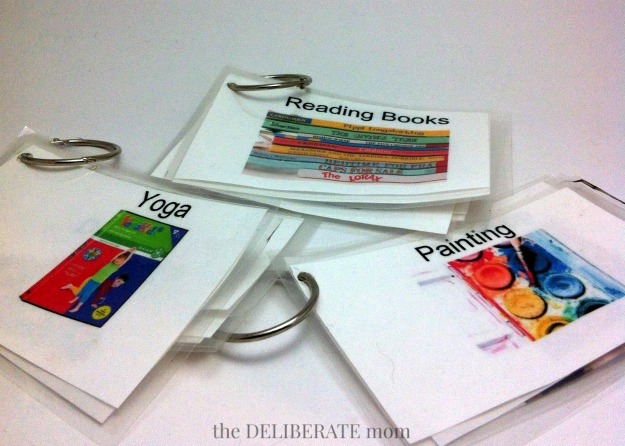 As I’ve shared before, I’m not THE Deliberate Mom, but rather I’m striving to become the deliberate mom I long to be. I’m so glad you enjoyed this Janine and I hope it helps you as you plan activities for your girls. I loved your post today Janine. It lit my fire this morning… I love it when a post does that. Well done! These are all really great ideas. I have to admit that I don’t engage as much as I would like due to my job. Good news is that in less than 2 weeks I’ll be retired and I’ll have all the time in the world, so I’ll be taking a few of these tips and implementing them in my day schedule with my 3yr old. Thank you for the printable too, I’m sure I’m going to need it. Here’s to a fab week! 2 weeks?! That’s soooo exciting! Wow…I have to say, I have never planned activities. I guess I am just spontaneous. Far too often I drop chores and cooking to engage with my children. We have a great time, build memories and make huge messes. If anything, I do that too much and let other things slide. I wish I could be more spontaneous Renee – unfortunately that’s not me. I often need plans and/or schedules because without them I’m lost and I fritter away my time. When I waste my time instead of being intentional, I feel some guilt. So, as I’ve shared here, these are some of the strategies I use to plan intentional time with my kids. Plus sometimes I think the adult needs to lead in this area because sometimes kids don’t know what to do with their time. I wonder for curiosity sake, if this is something that large families don’t struggle with as much? I wonder if more children of varying ages does naturally lends itself to more child-led opportunities to play? I know my girls, if left to their own devices, would be bouncing off the walls, fighting, and aimlessly wandering around not engaging with anything. Thanks for sharing your thoughts Renee! Awesome ideas, as always! 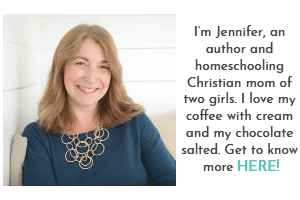 No wonder you are such a great homeschooler and blogger! I’m glad you enjoyed this Echo – and I take those statements as a huge compliment… thank you! Ahhhhhh AMAZING!!! Thank you so much for sharing all of this, seriously it was even more than I could have expected!! So much great advice and I really like your suggestions for writing it all down. I do that for everything else to get a clear vision for what I want, I should write down more specifically all of my goals for what I want to do with my kids. I also thought that was a great idea to write down honestly the wake and sleep schedule your kids are on, etc instead of changing your schedule to something that likely wouldnt pan out because it wouldn’t be realistic or would be too much of a change. ALSO the list of activity ideas, SO AWESOME!!! I can’t wait to check it out…so many amazing suggestions in one post. I’m delighted you enjoyed this Jessica… and that it’s given you some inspiration and ideas. It was kind of an epic post… I hope it helps! 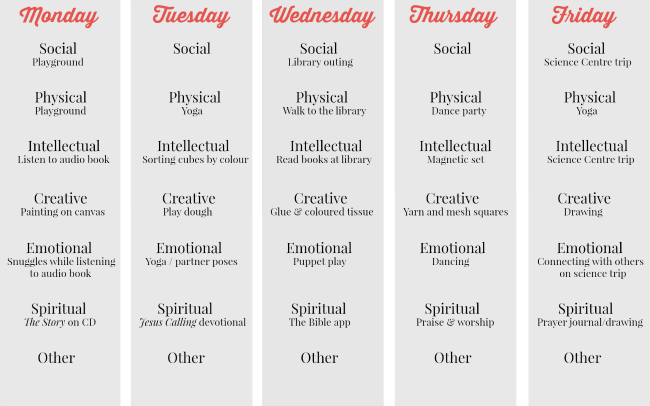 It’s great how you included different kinds of activities: social, physical, spiritual, etc. We often get lop-sided with just one aspect of our lives. 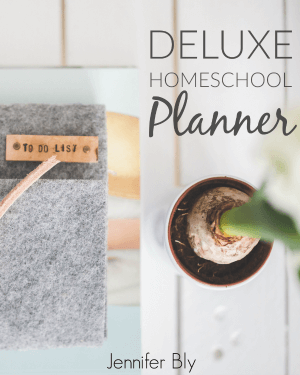 I find that if I’m not intentional, I get lop-sided with planning activities too (i.e. all creative and intellectual and very little physical). This is wonderful and so helpful! I love the idea of SPICES- so smart! I do well when I write down a plan. If I don’t write a plan, my good intentions tend to derail. I’m so glad you enjoyed this and that it was helpful! Nooooo, Tawnya, please don’t feel that way. Free play is a good thing! I need a schedule and structure and so do my children. If they don’t have it, they’re lost, unfocused, and kind of miserable. If free play all day works for your daughter then don’t change it… and if a spontaneous schedule works, then go with it. I don’t schedule out my kids’ playtime, but I do like the idea of making it more well rounded, with activities from different areas of life. I do think that larger families tend to have more organic variety going on. Sometimes I will direct play (like the post I did about making a block zoo for their beanie baby animals), and I do “school-y” activities, but I think there’s value to plain old playtime, too. I have unstructured “free play” time for the girls but as for intentional, planned activities, I like to have some structure (and also make sure I encompass all the areas of development within our day). Thanks for sharing your thoughts on this Shecki. I couldn’t live without structure. . . and as a teacher, I think most children would rather have it than not. I gives security in a lot of ways to some children. Free play, an absolute must in any child’s day. Call me old-fashion, but running outside, playing with friends, building, constructing, crafting, riding bikes, etc. now that is free time. Let them use their imaginations, something getting a bit lost in all the social media and technology. Good post! I agree! I think many children crave some form of structure. I know, I’m completely lost without a schedule. As for free play, I hear you… this is the type of “free play” I endorse too – running, playing in the yard, bubbles, make believe play… yes! Jennifer, you always have the most amazing ideas! I always feel like I’ve lost my creativity, therefore my activities won’t be as fun as the ones A does with her nanny (who is like off the charts creative). But I know she’ll love because she’s doing them with me. These are really great ideas! I’m so glad you enjoyed this Tiffany. I hope the ideas list will help you with those spontaneous moments of needing something to do. I love schedules too (I honestly can’t function without them). I learned about S.P.I.C.E. in early childhood development (but added the extra S for Spiritual) because for our family, that’s an important facet of development. I’m so glad you enjoyed this! I’m always happy to meet a fellow homeschooler. This is my second year of homeschooling. That first year was a tough one but we’ve fallen into a lovely rhythm this year. This could not have come at a better time. Thank you so much for sharing how you plan activities. I have never heard of S.P.I.C.E.S before. I can’t wait to get started! Glad I’m a subscriber for the free activity list, too! I’m so glad this was timely for you Charlee! 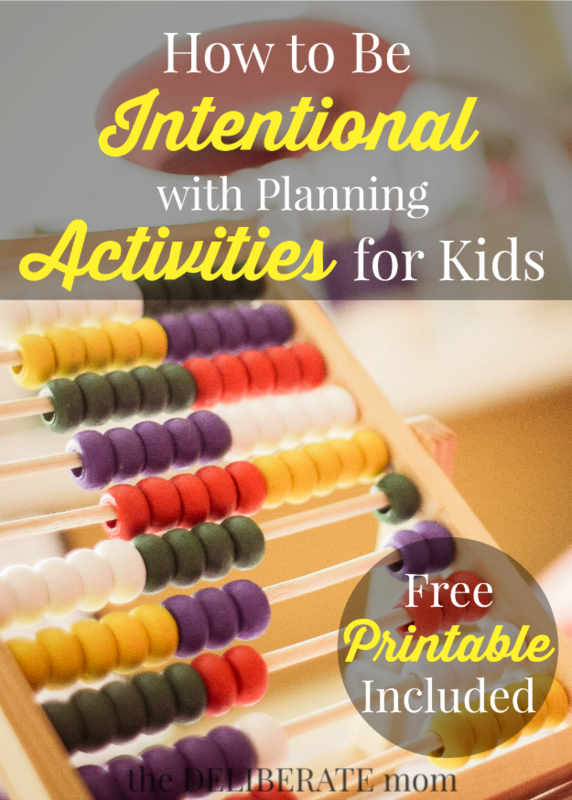 I hope you find some fun activities in the printable activity list. You are amazing! I have to admit that the last sculpting project we attempted was eaten by the baby. That did not go over well with the 7 year old. She has now taken to calling her sister Godzilla! 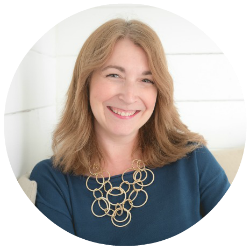 I love your idea though for writing things down, because that really does help us as parents to focus and be more accountable for both our time and other resources. I find that days with even just a quick sketched out plan go much better. I have more “follow-through” when I write things down. So glad you enjoyed this Jen! I’m glad you enjoyed this Cindy. Ugh… lately I feel like I haven’t had enough time for blogging. I still need to write posts for next week and I kind of feel like I want to just go out and enjoy the warmer weather. Balance is so important. A rhythm of active and busy, creative and intellectual, etc. can make the world of difference to the engagement level of our children. You’re right… it does get easier as they get older. Thanks for this post! Now that I’m slowly returning back to my old self after being on bed rest I would like to start planning more activities for my daughter and was feeling a little overwhelmed by it. I love SPICES! I’m going to be using that. This also made me realize how bad I need to schedule things out. Haha! I usually just wing it. Oops! If you can wing it, that’s GREAT! I know I need a schedule… I can’t survive without it (and my activities get very imbalanced without one). I’m glad you’re on the mend Carolina! I’m glad you enjoyed this. Yes, it is a blessing to be able to engage like this with our children. I LOVE this! I’m always pinning activities I find on Pinterest, and then feeling like I have no idea when or where to fit them in. Something about thinking about the different dimensions you listed is really resonating with my GTD-obsessed brain. I feel like now I’ll have a framework to intentionally plan them in, thanks! Also, I love that you focus in on the importance of setting an intention. Even if it isn’t as structured as a schedule, taking the time to recognize how we really feel about both the big (what kind of parent do i want to be?) and the little (what are we going to try to do today?) ensures that we are parenting consciously! bravo! I’m delighted that you enjoyed this Katy! I love planning for my children. If I didn’t plan, my best intentions would probably remain exactly that… intentions. I hope this helps you in your own intentional planning activities! I plan for my husband and daughter. I know he is somewhat relaxed about following it. He lets her lead him. She enjoys her time with her dad. I love the child-led interests too – it’s amazing what children can learn if we follow their lead and interests. I’m very deliberate with my parenting so this was an awesome read! I will definitely hold on to this for the summer months! Thanks for linking up with Waiting on…Wednesday! Hope to see you back tomorrow! I’m glad you enjoyed this Holly. In part, I need to be intentional, as I get scattered if I don’t have a plan. Great ideas! While I don’t feel like I’ll be able to fit in so many activities, just having two planned each day will feel monumental to me. Thanks, Jennifer. Two is great! Since I homeschool, I try to do a little more (especially for my youngest, who doesn’t really get much “book work” yet). Plus I plan things into the natural rhythms of our day. Thanks for sharing your thoughts on this Jelli!